Thanks for the heads up. I’m now will be on a hunt and destroy mission when the time comes to get 2015 products installed here. Do you know what the App Mgr mighr be doing during the brief time it auto starts and then shuts down? Phone home? I did check, and it does not appear to be phoning home when AutoRun=false. You can stop it before installing by hacking the setup.ini file (or the ini files in a deployment). Remove the instances of ADAPPLICATIONMANAGER to do this. I’ll be doing this in all our deployments. Thanks for the info! Had to disable this from starting for all of my users (our policy prevents them from installing/changing anything on their machines). A quick group policy object to deploy this text file with autorun disabled and we were good to go. Do you know how to silently uninstall Application Manager? Is there a way to achieve this? Running the uninstaller with the “–help” switch specifies that “–mode win32 unattended” is allowed. Does anyone know what AdSdsCheck.exe does … and how to get a clean (0) exit code from it? Ed, did you see Dean’s comment? Yes … confirmed “AdAppMgr.exe” process is not running and stopped the “Autodesk Application Manager Service” … per Dean’s comment. 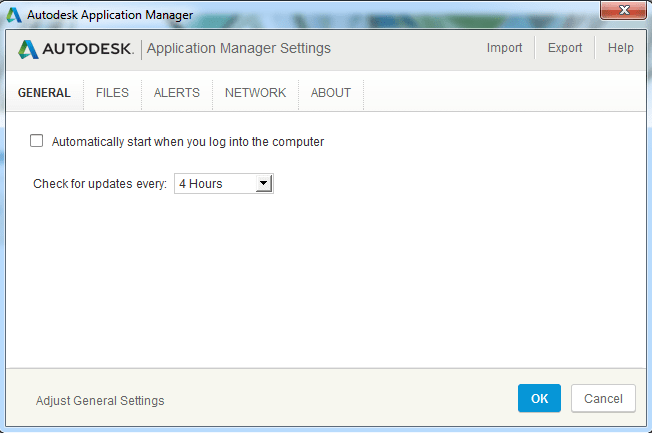 Running the (–mode unattended) switch results in the log output I specified above … and the “Autodesk Application Manager Service” is started up. Thanks for the information now I can at least stop the AutoCAD Application Manager from starting every time I restart my machine. Thank you, simple and efffective instructions. desactivar autodesk application manager es ir msconfig luego windows de inicio y buscar autodesk application manager y desactivarlo luego te pedira que reinicies la maquina pon si .